Hi guys! Just me, popping in for a quick hello! There is SO much to tell you, and I will most definitely be catching you up on the goings on that have been going on the past few months. Things have been happening. In big, real life changing ways. But today I have a recipe to share with you. Because It’s delicious and easy, and because Monday’s are hard, and just because I love you, I made you homemade Bailey’s. Yessir, homemade. And vegan, if you’re into that sort of thing. It’s super easy and the perfect cure for a case of the Monday’s. Add it to your coffee or cocoa, serve straight up over ice, or even sneak it into some baking, which I totes did, and it was amazing. Stay tuned! In medium pot whisk together coconut and almond milk. Add in brown sugar and whisk to combine. Bring to a low boil and stir frequently. Simmer for 8-10 minutes until it cooks down and thickens slightly. Remove from heat and add coffee and whiskey. Stir to combine. Store in sealed jars. The whiskey and espresso settles, so shake or stir it up before using. Store in the fridge. Should last about five days, like that’s likely. 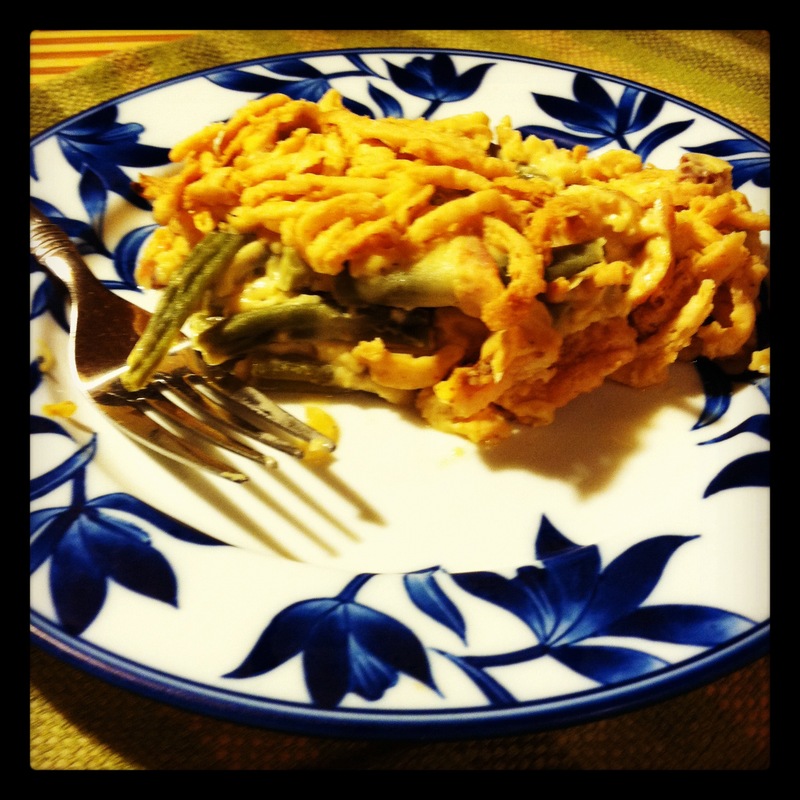 Green Bean Casserole, the good kind. There’s this thing that I make, it’s pretty awesome. I’m fairly certain it’s the main reason I’m invited to holiday dinners. For Christmas this year I was specifically told that I would be bringing my Green Bean Casserole. At Thanksgiving, my vegetarian friend ate some, realized there was bacon in it, and ate the rest in silence. Afterwards, he begrudgingly admitted to enjoying it after it was confirmed that there is indeed bacon included in this casserole. Yep, it’s that good. I shouldn’t take so much credit. I got this recipe from The Pioneer Woman, and I have adapted it somewhat. But after trying it last year for the first time I knew that this was the recipe I’d be using for-evah. No bigs. Your ingredients are simple, which I think is important around the holiday season. We don’t want to make something fussy if we don’t need to. This is also really easy to make ahead. You can put the entire casserole together the day before, sans french fried onions, cover and refrigerate. When you’re ready cover with onions and cook for 30 minutes. Amazingness, simplified. You’re welcome. Just remember that if you’re trying to share this with someone, and you want to take a picture you’ll need to snap one fast. This doesn’t stay around for very long. Cut green beans in half and start a large pot of lightly salted boiling water. Blanch the green beans: drop them in boiling water and allow to cook for 3-4 minutes. 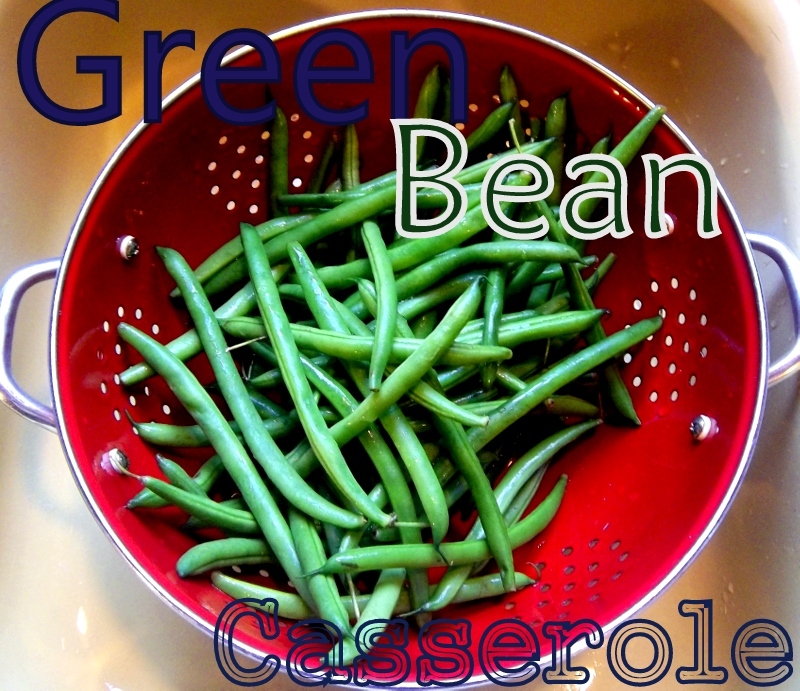 Drain green beans in colander and run very cold water over them until they cool down and stop cooking. Allow them to drain, when they are done spread into bottom of 9×13 casserole dish or baking pan. Add bacon to medium skillet and cook over medium heat. Cook for two minutes and then add onion and garlic and continue to cook 4-5 minutes. Until bacon is done and onions are golden brown. Remove from heat and set aside. In saucepan melt butter over medium heat. Sprinkle flour into pan and whisk to combine with butter evenly. Continue whisking while it cooks for a minute or two more. Add half and half and milk. Continue cooking, and whisking, while the sauce thickens, this should take 2-3 minutes. Add salt, pepper and cayenne before adding the grated cheese. Stir while cheese melts. Once that has happened, remove from heat and celebrate that you just made your very own white sauce! It’s a totally important thing to know. Add bacon and onion mixture to sauce, stir to combine. Pour over green beans and top with french fried onions. Bake for 30 minutes at 350 degrees or until sauce is bubbly and onions are golden. My best friend is pretty amazing. She’s funny and pretty and smart. We have nicknames, we can communicate with only our minds (sometimes), and she gives pretty awesome advice. We like a lot of the same things: cocktails, Gilmore Girls, Ryan Gosling and Leslie Knope. Unfortunately she’s allergic to soy. Do you know how much stuff has soy in it?!?! Everything. As her best friend I have accepted this soy-free challenge. Dinner rolls for Christmas? Sure! She’s really helped me expand my baking knowledge. It’s good to have a best friend who challenges you. These rolls are great, super simple and easy to make. I tried to make them look a little fancy by easily twisting them into knots. You don’t have to do that, you could just make them plain jane rolls. I bet they’ll still taste awesome. 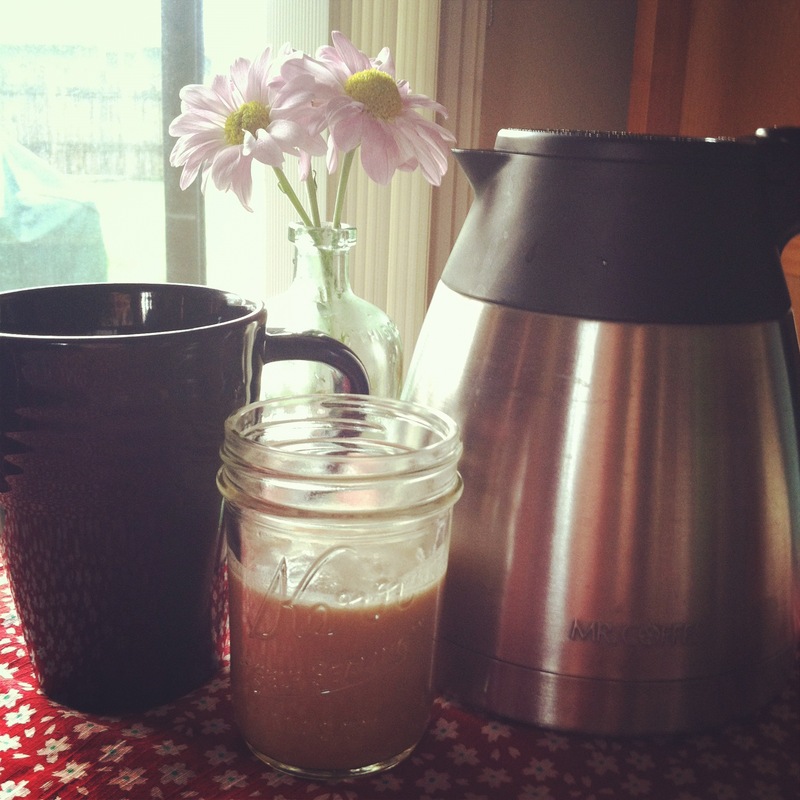 Warm your milk in a saucepan or microwave. It should be about 108-110 degrees, don’t get it to hot or you will kill the yeast which is a very bad thing. Put milk, yeast, sugar and salt into mixing bowl of stand mixer fitted with dough hook, stir together then let stand for 5 minutes. Next add butter, one egg and one cup of flour. Mix together until butter is no longer lumpy. Gradually add the rest of the flour and mix until it comes together and forms a ball. Move onto floured surface and kneed by hand for a few minutes. 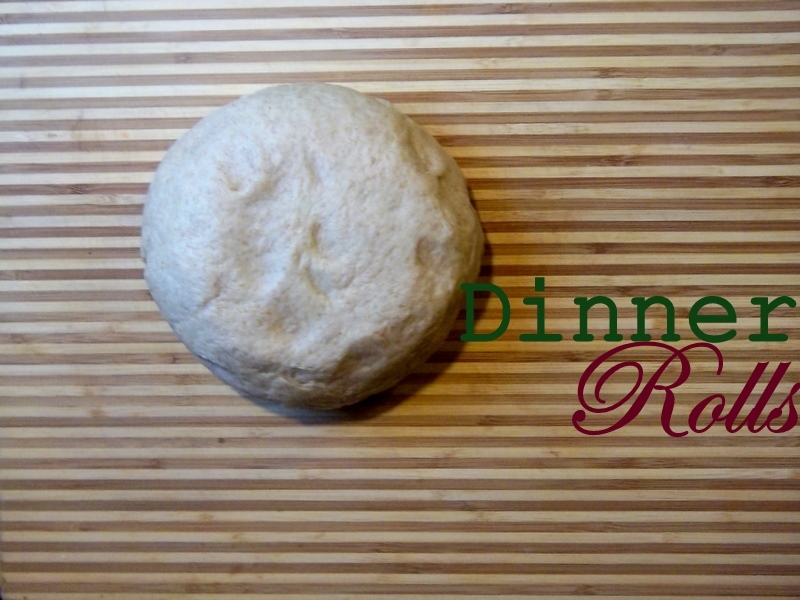 This dough is very soft, you can add up to 1/2 cup of flour if your dough is to wet. Place dough in greased bowl and cover with a tea towel. Let rise for about an hour, or until doubled in size. Once doubled in size punch dough down and re-cover. Let rise another 30-45 minutes or until it has doubled again. I weighed my dough into 2 1/2 ounce balls which gave me thirteen rolls. After weighing balls, you can either shape them in your hand to form a round roll or you can get fancy and twist them. To twist, roll them out into long cylindrical shape. Just go back to preschool when you made Play-Doh snakes and such. 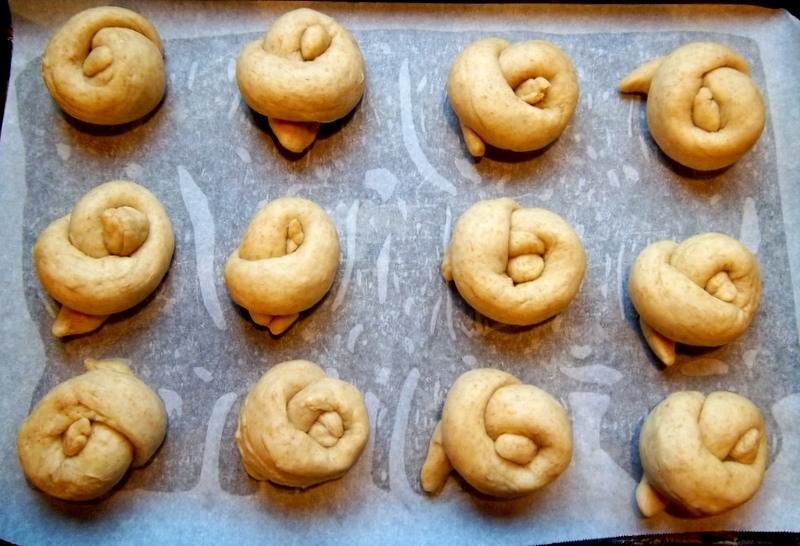 Tie the dough into a knot and pinch ends in. Give your rolls a little room on the baking sheet and then beat the other egg and use it as an egg wash to brush on top. Hi! I’ve been gone for awhile, you see I did this little thing called school and it kind of consumed my life for three months. I apologize for my absence, but not the school thing. That bit’s pretty important, but more on that later. I also changed my blog home, It’s basically the same except it’s rainydayswithgypsy(dot)wordpress(dot)com instead of blogspot(dot)com.No bigs. We’re all adjusting. So we’re good? Should we hug? Because I have made something to make up for my absence and changing addresses on you. Trust me, you’ll love it! I had this soup for lunch last month and I haven’t been the same since. I found it at the deli next to campus and have spent the last three weeks trying to figure out the recipe. Well friends, I have done it. And now I’m sharing it with you, because I love you and it’s Christmas. One more apology? There are no process photos, and the only picture I have is from my phone so it’s not great. Next time I make it I’ll fix this post. It’ll be like a 2-for-1 or something. This soup is perfect for a cold winter day, and is so good you’ll want seconds. Serve it up with some crusty bread just in case you need more carbs in your meal. Just do it, you deserve it. Preheat oven to 400 degrees. Wash potatoes and pierce with a fork. Bake potatoes for one hour. Let sit until cool enough to handle and peel skins. Place in bowl and roughly mash. Set aside. Remove seeds from jalapeno and dice. Don’t touch your eyes for the rest of the night. While potatoes are cooling place bacon in dutch oven over medium-high heat. Remove bacon and place on paper towels to cool. Drain grease from dutch oven and return to stove. Once cooled, crumble bacon and set aside enough for garnishment. Melt butter in dutch oven, use a spoon to get the left over bacon bits incorporated into the melting butter. Once butter is melted gradually add flour, whisking to combine. Once combined, gradually add milk, whisking to combine. Cook over medium heat until it gets thick and bubbly, it should take about 8 minutes. 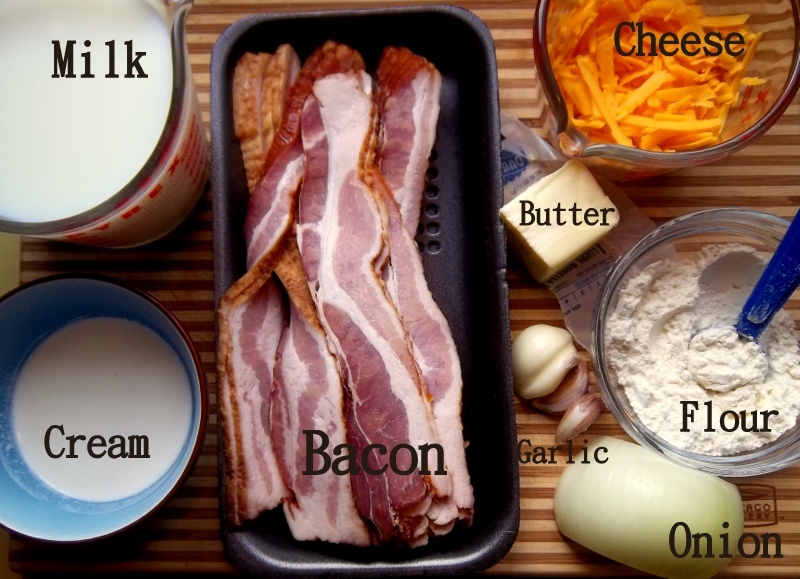 Add mashed potatoes, cheese, diced jalapeno, and bacon. Add salt & pepper and Paprika to taste. Stir until cheese melts. Once cheese is melted reduce heat to low and add sour cream. Cook on low for 10 minutes or until thoroughly heated but do not boil.